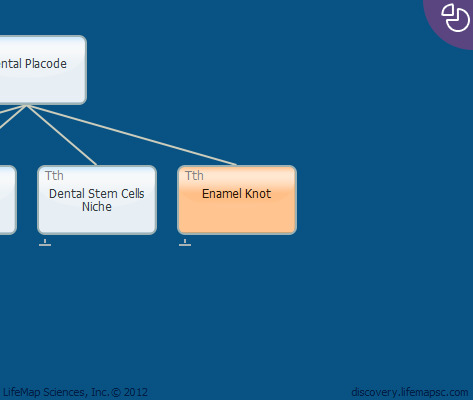 The enamel knot (EK) is a transient structure derived from the dental placode. The enamel knot functions in epithelial-mesenchymal interaction, which is responsible for tooth morphogenesis. The enamel knot serves as a signaling center responsible for formation and maintenance of the dental papilla. Primary EKs are formed at the tip of the tooth bud, and appear at E14.5, during the transition from the bud to the cap stage. Primary EKs are fully functional at the beginning of the cap stage. Formation of the enamel knot depends on BMP signaling from the underlying mesenchyme. Primary enamel knots stimulate the adjacent epithelial cells to proliferate and form cervical loops. Simultaneously, primary enamel knots support proliferation of mesenchymal cells to form the dental papilla. In molar teeth, primary enamel knots are removed by apoptosis at E16.5 and secondary enamel knots are formed at the future cup formation sites. Secondary enamel knots maintain interaction with the previously formed dental papilla and allow further differentiation and completion of tooth morphogenesis. The primary and secondary enamel knots express multiple signaling molecules, such as Shh, BMPs, Wnts and FGFs.